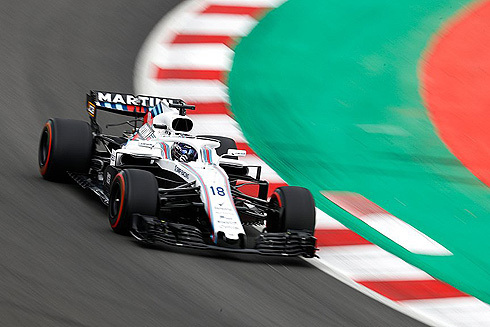 After three difficult practice sessions where neither Williams driver would move off the bottom of the times qualifying for the 2018 Spanish GP was no better. Both Williams drivers would not make it past the first period of qualifying. 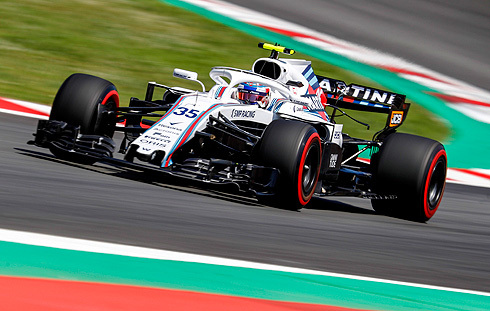 Sergey Sirotkin would finish ahead of team-mate Lance Stroll with the pair in 18th and 19th. For Lance his session was marked by an off-track moment that saw his qualfying end in the gravel. Now it was down to Sunday's race where both drivers will have the choice of tyres at the start, maybe this will help their performance. After struggling through the practice sessions the prospects for qualifying were not looking the best for Williams. Hartley had crashed his Torro Rosso in the final practice and would not be running. Both Williams drivers would complete their first flying laps but would drop down the order quickly. Quickest would be Raikkonen with a 1m:17.483 followed by Hamilton and Vettel. Bottas would move up to third followed by Vettel and Verstappen. The Williams pair were 16th and 17th. Vettel would go quickest with a 1m:17.031 with the top five all on the supersoft tyre. Alonso would be sixth but he was on the medium tyre. With the final runs been completed the Williams drivers were 17th and 18th with Lance leading Sergey. Verstappen was able to move up to second followed now by Raikkonen and Ricciardo. Hamilton and Bottas were now fifth and sixth with five minutes remaining in the period. With the end of the period the Williams drivers would finish in 18th and 19th which is unfortunately where they were expected to be. The second period would see all the top runners on the soft tyre. Vettel would go quickest with a 1m:16.802 followed by Raikkonen, Bottas and Hamilton. Verstappen and Ricciardo weer fifth and sixth. Seventh and eighth were the Hass cars of Magnussen and Grosjean. Magnussen was able to move up to sixth ahead of Ricciardo. With the end of the period the order would remain the same with Vettel still quickest. The final period would get underway with everyone out on the supersoft tyres. After the first runs it would be Hamilton from Verstappen, Ricciardo, Bottas, Vettel, Alonso, Raikkonen, Grosjean, Sainz and Magnussen. The second run in the final period would see several drivers come out on the soft tyre but Hamilton would go quickest with a 1m:16.173 running on the supersoft tyre. Bottas also on this tyre would move up to second with Raikkonen now third on the soft's. Vettel would move ahead to be third followed by Raikkonen, Verstappen, Ricciardo, Magnussen, Alonso, Sainz, and Grosjean tenth. 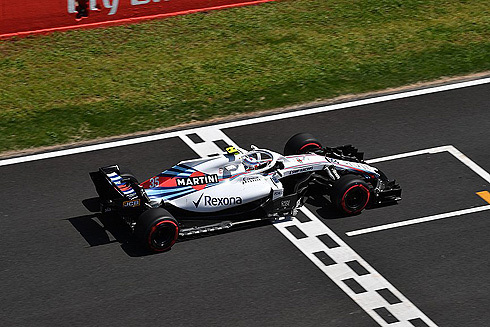 But for the Williams martini team it was a session marked by disappointment with both drivers failing to improve from the rear of the times. But based on their practice pace the result were not a real surprise. Now comes the race where the Williams drivers will have the choice of tyres. No doubt this will involve the use of the soft tyre at some stage. Lance would be first oit in the opening period running on new supersoft tyres. Lance would set a 1m:20.623 on his firs lap. Lance would improve with a 1m:20.225 to move ahead of Sergey. Lance would pit after a quick five lap run. Lance was back out on a new set of supersoft tyres for his final run. Lance was on a quicker lap but it would go wrong as he went off at Turn 13 ending his session in the gravel. This was the third time he had gone off over the weekend. His car understeered through Turn 12 and Lance kept his foot in but he would spin in the gravel. Maybe Lance would have recovered if he had not have kept his foot in it. Lance was out of the first period. Sergey would follow his team-mate out also on new supersoft tyres. Sergey would finish ahead of team-mate Lance with a 1m:20.302. Sergey was on a quicker lap but would fail to improve in the final sector. He would also pit again having completed five laps. Sergey was also back out and was on a quicker lap, again on the supersoft tyres. But he would have a big moment on the final sector and would fail to improve losing 0.8 in the final sector. But his next lap would see him set a 1m:19.695 to move ahead of his team-mate. As a result Sergey would not make it past the first period.